"Working as a photojournalist for many years gave me the best background and introduction into documentary wedding photography I could imagine." I spent the first 20 years of my career working in the newspaper industry on a regional, national and international scale. My work has featured on the front page of every national newspaper in the country. I have worked across the globe shooting stories from conflicts to celebrations, Royals to the homeless and been very lucky to have gained access to places only a press pass will allow. For as long as I can remember I have held a camera in my hand and was first introduced to photography in my early school years by my father, a keen amateur, in the 1970s. Together we worked on images and I won my first photography competition in our local paper aged 10 years old. 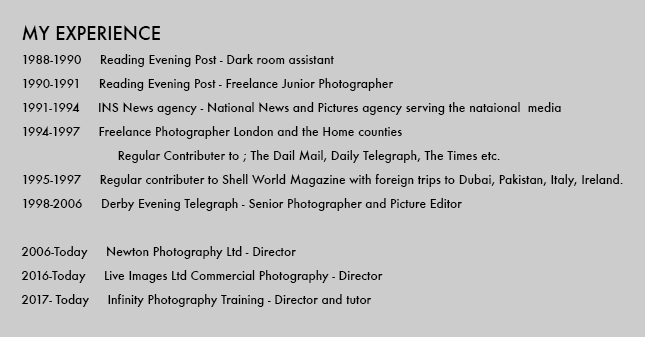 At 16 I began working in the darkroom of one of the top regional broadsheet newspapers and went on to train with the NTCJ (National Council for the Training of Journalists) subsequently becoming a regular contributor to The Times, Daily Telegraph and Daily Mail. Eventually I moved to Derbyshire and became picture editor at the Derby Evening Telegraph, before setting up my own company in 2006. Although I still shoot the occasional commercial assignment and press jobs, capturing the emotion and priceless one-off moments of a wedding day is where I get the most pleasure. I feel privileged to tell the story of my client's most joyful day through the images I capture. From the bride's preparations to the first dance, I ensure those beautiful, spontaneous moments are captured forever to provide the full story of a wedding. It is difficult to think of any other occasion when so much love and joy is on display and I pride myself on capturing the priceless moments, the characters and emotions, to provide a distinctive and beautiful documentation of the day for whole families to treasure. I still get a buzz from taking a great image and my background as a press photographer means I am able to document the day unobtrusively, using my photojournalistic skills. I shoot mainly with available light which enables me to capture the atmosphere and be discreet. My aim is to provide the bride and groom with a stunning collection of images which represent their true memories of the day - and all the other bits they were too busy to notice or remember!